This guy is an authentic model of a World War 1 tank for your WW1 or museum scene. Based on the Mark IV tank, this is a conversion called 'Tad Pole' featuring the extended rear made to be able to cross the German trenches. Experimental versions of this tank also had a mortar placed on the back which this model also includes. Photos of this tank are rare because it never got to see battle before the war was over. That very long body makes this tank a rare piece compared to the regular shorter Mark IV tanks. 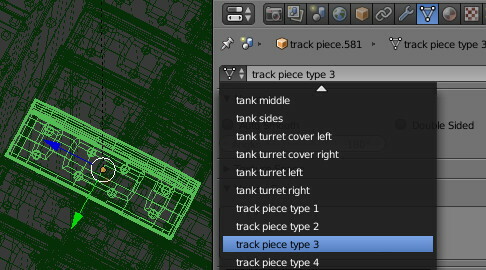 Appending the model into your scene is done by appending the Mark IV tank group. All parts are parented to the Mark IV tank parent empty so moving and rotating the tank is easiest by using the parent. Subdivision modifier level 2 is enabled for most parts, so this can easily be tweaked if the tank is going to be used as background object. Tank treads are without modifiers to allow use of instancing. The turrets and Lewis machine guns rotate freely inside their allowed areas. Rotation limitations are set up with constraints which can be changed or removed if needed on Blender's constraints panel. Textures are in three sets: middle part of the tank, sides (including turrets and Lewis guns), and tank treads. Middle and side textures are 4096px and tank treads are 1024px. Bump maps are also included and these are used only by Cycles instead of the normal maps. Using the normal maps will result in render artifacts at some camera angles with Cycles. So only LuxRender uses the normal maps. The tracks are a mix of four mesh pieces with different uv's to get a variation in the texture. Their face and vertex count/position are the same, they only use different object data to allow different uv's. To get the same uv on all pieces change the object data to the desired piece type.